Dōtaku (銅鐸) are Japanese bells smelted from relatively thin bronze and richly decorated. Dotaku were used for about 400 years, between the second century B.C. and the second century C.E. (corresponding to the end of the Yayoi era), and were nearly only used as decorations for rituals. They were richly decorated with patterns representing nature and animals, among which the dragonfly, praying mantis and spider are featured. Historians believe that dōtaku were used to pray for good harvests, as the animals featured are natural enemies of insect pests that attack paddy fields. 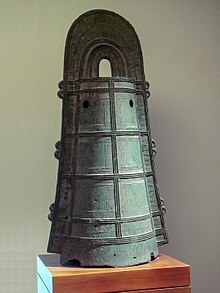 According to Japanese folklore, dōtaku were used as emergency bells (such as a watch tower’s bell); intended especially in cases of invasion, particularly invaders from the Korean peninsula. When sentinels spotted invaders, they loudly rang the dōtaku as an alarm, so that people could hide themselves or their possession, and to alert warriors to prepare themselves to repel the enemy. There is a dotaku museum devoted to the bells in Yasu city, in Shiga prefecture, in central Japan. During the Yayoi Era (400 B.C.E. – 300 C.E. ), a great number of technological innovations occurred. Unlike the earlier nomadic Jōmon people, the Yayoi emphasized having large community settlements and the cultivation of rice. Along with these, they learned how to cast bronze and iron in order to create various metal objects such as weapons, mirrors, and several tools. Among the bronze objects, dotaku, one of the most distinctive objects of the era, were created. In recent years, dotaku have been studied by researchers in order to decipher their origins, how they were created, their various purposes, and the reasons for the images on the main body. Despite being a well-known artifact of the Yayoi era, the concept of dotaku did not initially originate in Japan. According to several studies, these bells are thought to be derived from "earlier, smaller Korean examples that adorned horses and other domesticated animals", from Chinese cattle bells, or Han Chinese zhong, which were bells without clappers used for composing ritual music. However, further studies show that the Yayoi did not have cattle farms, and although several dotaku do have suspension rings and clappers, they make "muffled tones" or "rattling sounds" when struck, suggesting that they were not meant to be rung. Therefore, any bells from China were imported as ritual objects. In total, over four hundred dotaku have been found in Japan, mainly in western Honshu, the Tokai District, Shikoku, and the Kansai region, namely Kyoto, Nara, and Osaka. The "first recorded discovery of dotaku" was in 662 C.E. at a temple located in Shiga Prefecture. They are often "found buried on isolated hillsides" either ‘singly, [in] pairs, or in large groups" along with various bronze mirrors and weapons. When buried in groups, researchers have speculated that several clans each buried their only dotaku in one area to signify the unity of all the clans. Physically, the body of a dotaku consists of "a truncated cone shape" with an oval cross-section and "has rows of horizontal bands divided in the center by a vertical row". Arching and extending over the top and the sides of the body is an "elaborate flange filled with sawtooth design and projecting spirals". The materials used for dotaku came from both Korea and China since "bronze resources were not found until the 7th century", thus bronze was considered more precious than iron. In addition, researchers have detected lead traces inside the bells, which was a common characteristic of Chinese metals. These Yayoi bells vary in height ranging from 4 inches to 50 inches, approximately 10 cm to 127 cm. In conjunction with the varying height, the styles of the bells also varied greatly. Across several regions, this scattered production continued until a group of bronze-smiths congregated and decided on a standard. These bells were originally made through the use of two-part sandstone moulds, in which "designs were carved" in order to create the appearance of raised bronzes lies on the outer surface. Many of these sandstone moulds were "found in abundance in northern Kyushu" and near Kyoto, Osaka, and Nara. As time progressed, dotaku gradually became larger in size and thinner due to the fact that they were now being made using clay moulds instead of sandstone. This allowed for more detailed work, such as simple line drawings, compared to the smaller and thicker sandstone moulds. Other purposes of the dotaku are still being debated by researchers, but it is certain that they were used for agricultural rituals and rites, as supported by various sources. Researchers suggest that, when not in use, dotaku were buried "in the ground to receive Earth’s life force", thus ensuring agricultural fertility for the community; they were also believed to have been used to pray for rain. These beliefs and suggestions are supported by the fact that many dotaku had inscriptions of "flowing water, waterfowl, fish, boats, and agricultural objects" on them. Although it is unknown whether or not dotaku were "used by the chieftains for small principalities or by villages in public community festivals", it is certain that they belonged to the community as a whole rather than an individual. Some alternate theories include dotaku being used as "a sundial, producing gold, heating water for bathing, or related to secret Jewish practices", although these explanations have little support within the mainstream archaeological community. Regarding the designs of dotaku, they contain many aspects that resemble Chinese objects. For example, many early bells had "delicate decorations [that] resemble contemporary Chinese mirrors". It wasn’t until later in the Yayoi era that decorations "with scenes of animals and humans hunting or farming" were used. Along with these depictions, there are also images of the typical Yayoi "elevated granaries and scenes of rice being pounded". Many depictions of deer appear on dotaku the most, even though the "Yayoi ate mostly wild boar". According to "Harima Fudoki", which is a series of reports comprised in the Nara period (710 C.E. – 793 C.E. ), there was "a magical ritual of sowing seeds in deer blood that was used to speed up the germination of rice plants" because it was believed that "the deer’s life force helped the growth of rice", which explains why the character Forest Spirit in the film Princess Mononoke was a human-faced deer. There have also been studies as to whether or not the images on the dotaku have significant meanings. According to a researcher named Oba, each picture contains a hidden pictograph that can be deciphered through a phonetic reading. For example, a picture of a man shooting a deer can be read as "iru ka" (to shoot a deer), but when combined to form "Iruka" , the pictures refer to Soga no Iruka, which is a reference to the Soga Dynasty. Through several more readings, Oba discovered that the drawings "contain references to precise persons, places, and events in Japanese prehistory" as well as provided "info of shapes of buildings, hunting customs, and other aspects of daily life", possibly left for future generations. However, due to a lack of concrete evidence, other researchers have deemed it improbable that the pictures are actually hidden pictographs; it is possible that the pictures are just pictures. Despite the lack of evidence, researchers do believe that the pictures aren’t just casual pictures drawn for the sake of art, that there is some other meaning behind them. The deer, often depicted on the surfaces of dotaku, is physically manifested in the film Princess Mononoke directed by Hayao Miyazaki. In the film, Forest Spirit is a "god of life and death" and is characterized as a large deer with a human-like face. The Pokémon Bronzong is designed after a dōtaku. ^ a b c Mason, Penelope. History of Japanese Art, 2nd Edition. pp. 22–27. ^ a b c d e f g h i j k l m "Bell (dotaku) [Japan] (18.68) | Heilbrunn Timeline of Art History | The Metropolitan Museum of Art". www.metmuseum.org. Retrieved 2015-09-14. ^ a b c d e "Two dōtaku (ritual bells)". The British Museum. The British Museum. Retrieved 2017-01-29. ^ a b Imamura, Keiji. Prehistoric Japan: New Perspectives on Insular East Asia. pp. 170–177. ^ Kleiner, Fred. Gardner’s Art through the Ages: A Global History. p. 477. ^ a b c "Japan, Late Yayoi Period / Dotaku / 100-200". www.davidrumsey.com. Retrieved 2015-09-14. ^ Mizoguchi, Koji. The Archaeology of Japan: From the Earliest Rice Farming Villages to the Rise of the State. pp. 180–195. ^ The Shimane Board of Education (1986). "荒神谷遺跡発掘調査概報 2 銅鐸・銅矛出土地". Comprehensive Database of Archaeological Site Reports in Japan. Retrieved 2016-09-01. ^ a b "History - Yayoi Period". Retrieved 2015-09-14. ^ a b c d e f g h "Dotaku (Ritual Bronze Bells) and the Yayoi Period | 京都国立博物館 | Kyoto National Museum". www.kyohaku.go.jp. Retrieved 2015-09-14. ^ a b Hall, John Whitney. The Cambridge History of Japan, Volume 1. pp. 332–334. ^ a b c d Miller, Roy Andrew (1975-04-01). "Review". Journal of Japanese Studies. 1 (2): 485–506. doi:10.2307/132139. JSTOR 132139.